The Carr Square Neighborhood is located in the Near Northside area of the city of St. Louis. Its boundaries are Cass Avenue on the north, Tucker Blvd on the east, the line that runs along Cole on the south and Jefferson Avenue on the west. The surrounding neighborhoods are St. Louis Place to the north, the Columbus Square Neighborhood to the east, Downtown West to the south and the JeffVanderLou Neighborhood to the west. Three St. Louis City parks are located in the neighborhood; De Soto Park is the largest, Murphy Park and Loretta Hall Park are the other two. The amenities of the three parks include a total of over 30 acres of parkland, two soccer fields, two playgrounds, youth and adult softball and baseball fields, three full court basketball courts, picnic facilities, a horseshoe court and an asphalt walking trail. The Carr Square Neighborhood is within the St. Louis Public School District. Several of the district's schools are located in Carr Square. Those schools are the Gateway Math and Science Preparatory Middle School, Gateway Math and Science Elementary School, Gateway Michael Elementary School, Carr Lane Visual and Performing Arts Middle School and Jefferson Elementary School. Central Catholic St. Nicholas School, a private Catholic elementary school, is also available to the residents of the Carr Square Neighborhood. The area was first settled by German Protestants that lived around the Protestant church that was located there. About 1842, Irish immigrates came from Kerry in Ireland to the area. John Mullanphy, an Irishman himself who owned most of the land in Carr Square, was sympathetic to their blight and allowed them to squat forming the community known as the "Kerry Patch." The Polish eventually came to Carr Square as the Irish moved on. St. Stanislaus Kostka Church is located in the Carr Square Neighborhood. The parish was established in 1878 for the Polish community that was there in the neighborhood. 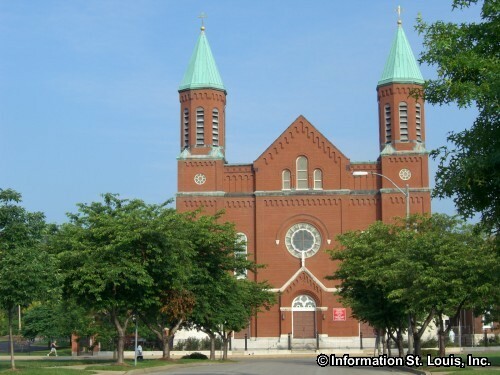 The church building was completed in 1880 and is on the National Register of Historic Places and is a St. Louis City Landmark. The failed, infamous Pruitt-Igoe Housing Project was located in the Carr Square Neighborhood filling the entire acreage enclosed by Jefferson Ave to the west, Carr Street to the south, 20th to the east and Cass to the north. Built in the mid 1950's, it was intended to receive the African Americans that were displaced by the demolition of the Mill Creek Valley community, as well as low income white and black residents. When is opened in 1956, the majority of 2,870 apartments located in the project remained unoccupied and the complex began to rapidly decline. By the late 1960's only 1/3 of the apartments were occupied and by 1971 only 600 people lived in the project. In 1976, the Pruitt-Igoe Housing Project was imploded. The land that it sat on remains mostly vacant.